A Gag Reel, And More! BURBANK, CA (June 3, 2015) – What can you expect when embracing your bad self is the only option? Find out as the thrilling journey of the Winchester brothers continues when Warner Bros. Home Entertainment releases the tenth season of Supernatural on Blu-rayTM, DVD and Digital HD on September 8, 2015. Supernatural: The Complete Tenth Season contains all 23 gripping episodes from season ten and is packed with over four hours of bonus content – including featurettes, commentaries, a Comic-Con panel, deleted scenes, and a gag reel. 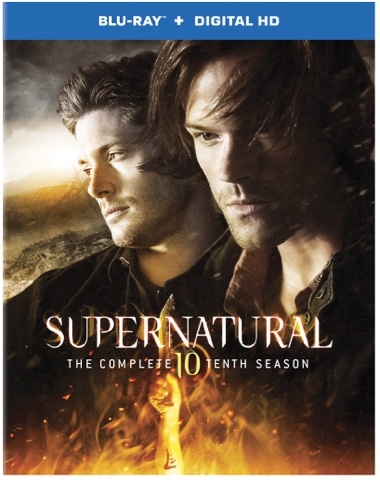 Supernatural: The Complete Tenth Season is priced to own at $49.99 SRP on DVD and $54.97 SRP on Blu-ray. After Dean Winchester lost his battle with power-mad angel scribe Metatron last season, he was resurrected by the power of the First Blade and transformed into a demon, cursed with the Mark of Cain. The road to recovering wayward Dean takes brother Sam down sinister paths himself, with consequences that will shake the boys to their core. The Winchesters’ angelic comrade-in-arms Castiel must pick up the pieces in the aftermath of Metatron’s campaign to overtake Heaven. With his divine “grace” failing and rogue angels still loose, Cass faces the ticking clock of his own mortality while all-new and ages-old threats again push our heroes to their human and otherworldly limits. At the same time, the King of Hell, Crowley, must deal with dissension within his own twisted family. Supernatural: The Complete Tenth Season will unleash your inner demon and hold you spellbound. Airing Wednesdays at 9/8c on The CW, Supernatural stars Jared Padalecki (Friday the 13th, Gilmore Girls) and Jensen Ackles (Smallville, My Bloody Valentine) as Sam and Dean Winchester, in addition to Misha Collins (24, Girl Interrupted) as Castiel and Mark A. Sheppard (In the Name of the Father, White Collar) as Crowley. Created by Eric Kripke (Revolution), the tenth season of the hit series was executive produced by Robert Singer (Lois & Clark: The New Adventures of Superman), Jeremy Carver (Being Human), Phil Sgriccia (Smallville) and Adam Glass (Cold Case). Produced by Wonderland Sound and Vision in association with Warner Bros. Television, Supernatural returns for its eleventh season this fall on The CW. With Blu-ray’s unsurpassed picture and sound, Supernatural: The Complete Tenth Season will be released in 1080p Full HD Video with DTS-HD Master Audio for English 5.1.